Okay, so you didn’t become an astronaut. But it’s not too late to make your childhood dreams come true, thanks to these scrumptious ice cream sandwiches. 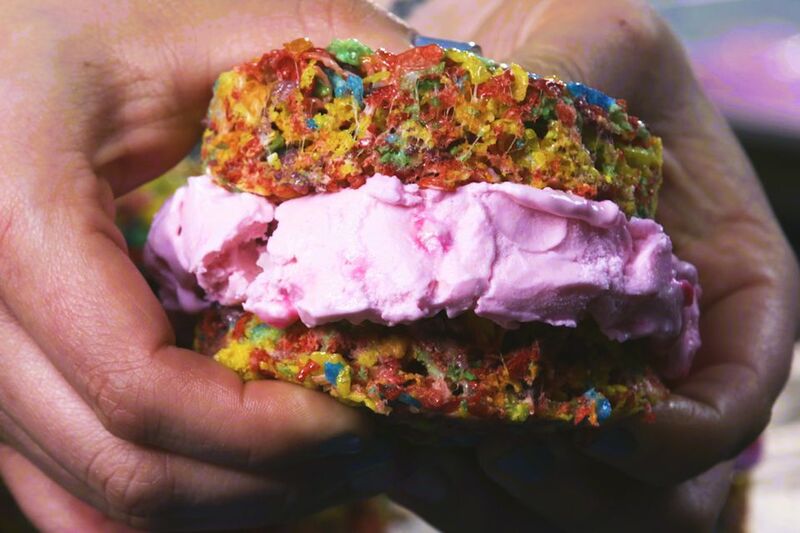 The outside of these sammies are marshmallow-bound Fruity Pebbles, Lucky Charms, and Cocoa Pebbles. They’re respectively filled with bubblegum, mint chocolate chip, and strawberry ice cream and the result is magically delicious. Pick your favorite cereal or make all three for a collection of nostalgic desserts. In a large saucepan over low heat, melt the butter. Once completely melted, add one bag marshmallows and stir until completely melted and smooth. Remove from heat and quickly stir in Fruity Pebbles until well coated. Using wax paper or a spatula, press mixture into sheet pan until about 1/2 inch thick. Let cool at least 20 minutes. Repeat steps one through three with remaining butter and marshmallows for both the Cocoa Pebbles and the Lucky Charms. Using a cookie or biscuit cutter, punch out different sized circles. Place a big scoop of bubblegum ice cream in between two Fruity Pebble circles and press down. Use a big scoop of strawberry ice cream for Cocoa Pebbles circles and mint chocolate chip ice cream with Lucky Charms circles. Repeat to make 2 to 3 more sandwiches for each cereal. Roll outside edge in sprinkles, if using.